Celebrate this special year with a special donation! The Groton Conservation Trust officially turns 50 later this month, yet celebrated all year long with a series of special events. A fascinating talk by Ted Elliman about invasive species. 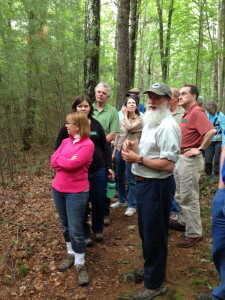 A walking tour with Tom Wessels interpreting the history of the Gamlin Crystal Spring landscape. A 50th Birthday Bash at Williams Barn on November 8 with the creature teachers, live music by the Contra Banditos, bird house building, and guided hikes for kids and adults. During the 50th birthday party, the Creature Teachers introduced children to the creatures in their neighborhood. 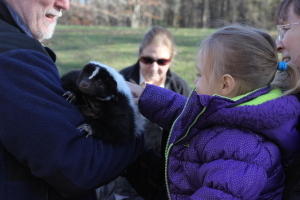 Kids of all ages enjoyed a beautiful day petting animals, building birdhouses, taking “I spy” hikes in the woods, music and cupcakes! A visit with Ben Kilham, the Bear Man, including a presentation on black bears and how we can learn from their behavior to be better humans. If you love exploring well maintained trails through gorgeous woods, please consider a special donation to celebrate our 50 years. You can give online and securely by using the Donate Now button. This anniversary is remarkable not just in terms of time; it tells a story of land preservation that is unparalleled in our area. In the past 50 years, the Trust has grown from accepting fee simple donations to protecting land through limited development projects to accepting conservation easements. Now we are the stewards of more than 40 properties totaling over 1,400 acres, yet we remain an all-volunteer, single-town organization. To acquire this much prime acreage would not have been possible without many generous gifts of land and funds over the years. But acquisition is only the first step. We must manage all these properties responsibly — promoting healthy ecologies, viable habitat and recreational opportunities for everyone to enjoy. Fighting invasive species GCT has become a pioneer in invasive species management and even received a major grant from The Community Foundation of North Central Massachusetts for this work, allowing us to share these best practices with other conservation groups. Continuing this effort requires equipment, applications and documentation. Your support can help fund the treatment of additional affected areas. Educating youth GCT has hired college interns for the past two years to assist us with this important invasive species field work. In addition, interns were instrumental in helping with the property inventory and documentation necessary for our rigorous accreditation application. Your contribution allows us to continue hiring the next generation conservationists. Increasing membership We want to increase our working membership base by building the numbers of involved families. We are embarking on a purposeful membership drive and used this anniversary year to actively invite people to enjoy our properties. We are also developing plans that will increase the recreational value of our properties, such as a public park on the summit of The General Field. Your donation allows us to increase our membership and fund this targeted effort. Growing the endowment Every non-profit understands the importance of creating a lasting endowment that will ensure the viability of an organization for years to come. What better time to fortify our endowment than this momentous anniversary? With the support of generous donors, we are able to match donations during this anniversary year. Your generous donation will go an extra-long way to secure the future of open spaces. We will be mailing out our annual appeal soon, so please consider an extra-generous donation this year to celebrate what the Trust has been able to create for our community. This entry was posted in News by Groton Conservation Trust. Bookmark the permalink.